The Dutch company Ecofuels produces biogas from vegetable-based material. 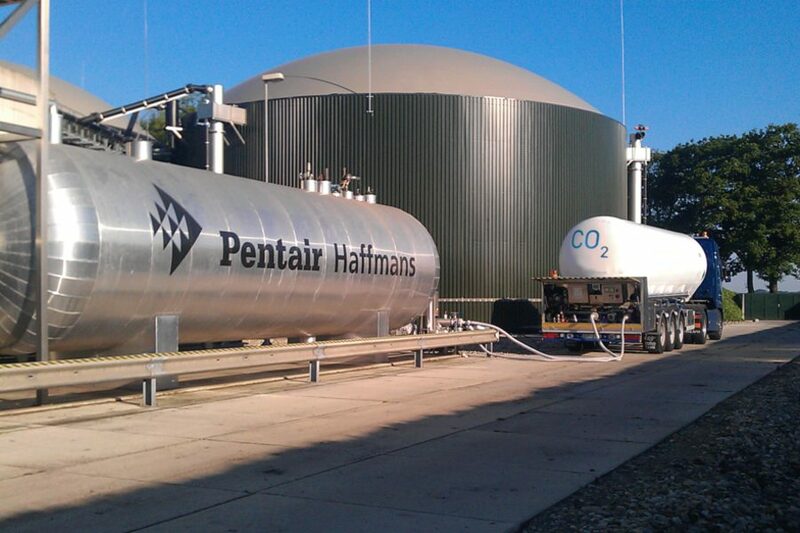 Pentair Haffmans was awarded a contract for the supply of a biogas upgrading system, that will enable the company to generate more than 2,200,000 m3 of biomethane per year and recover 2,520 tons of food-grade carbon dioxide (CO2). Ecofuels is an initiative of the Dutch companies Laarakker Groenteverwerking B.V. and Delta Milieu Compost & Biomassa. Laarakker grows 110,000 tons of vegetables annually on 3,500 hectares (8,650 acres) and sells them to producers of canned, frozen and juice products. Delta Milieu Compost & Biomassa is a vegetable waste management specialist that processes 400,000 tons of vegetable waste to compost each year, which is sold as fertilizer to agricultural and gardening enterprises. A sustainable resources management and renewable energy concept is an integral part of Ecofuels’ philosophy. In 2006, the company started two biogas fermenters at its premises in Well, in the south of the Netherlands, with a total electrical output of 2.5 megawatts. Each year 120,000 tons of vegetable-based material is used as substrate. A part of the substrate comes from Laarakker’s vegetable production cutting waste, the rest from external suppliers. In 2011, the company decided to expand the capacity of the existing digesters with an additional 450 m3 per hour. Biogas is a general term for gas produced through an anaerobic fermentation process and consists primarily of methane (CH4) and CO2. Pentair Haffmans’ biogas upgrading technology offers two substantial advantages compared to conventional methods. The technique used by Pentair Haffmans makes it possible to recover 100 percent of the methane, so the environmentally harmful ‘methane slip’ that usually occurs with other upgrading techniques is eliminated. In addition, the CO2 by-product can be recovered and sold as a useful product. 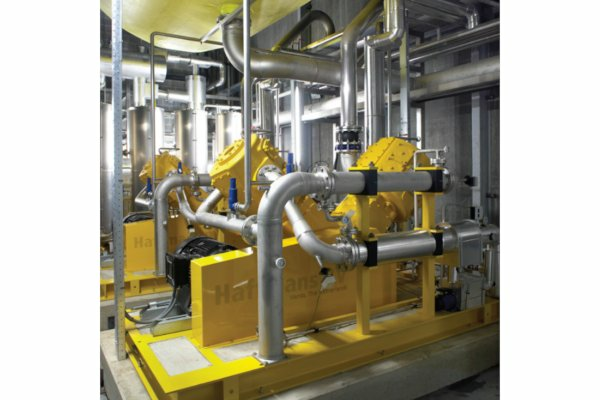 Pentair Haffmans and Ecofuels developed a concept how both the biomethane and the CO2 by-product could best be deployed. Because the biomethane has the same specifications as natural gas, it can be fed into the national gas grid, enabling Ecofuels to receive the feed-in remuneration that is prescribed in the Dutch renewable energy regulation. Calculations have shown that from the surplus of biogas more than 2.2 million cubic meters of biomethane per year can be produced. Pentair Haffmans designed a biogas upgrading system housed in a 13 x 7 x 4.5 meter building. The system was installed in 2011. Biogast, a Dutch biomethane specialist, provided its Bio2Net feed-in station to connect the system to the grid and guided the project through all procedures and permits. In addition to biomethane 2,520 tons of CO2 will be produced annually at Ecofuels. During the biogas upgrading process the CO2 is pressurized and cleaned using an activated carbon filter. Then, the CO2 is liquefied through cooling to a temperature of -24 °C (-11 °F) and led through a stripper column where the remaining methane is removed and is fed back to the membrane unit. The liquid CO2 flows out of the stripper column into a buffer tank where it is stored for future use. This food-grade quality CO2 is useable in a variety of applications including as gaseous fertilizer in greenhouses, as a cooling agent in industrial applications or for the production of dry ice.